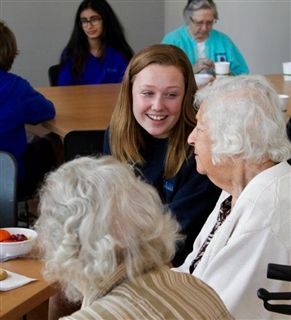 Each week, as part of the "Senior Connection" rotation of the Middle School Service Learning Program, students walk to Bressi Ranch to spend time with residents at the ActivCare assisted living facility. There, students and residents play games, work on crafts, and share stories. According to the students, their ActivCare friends especially love hearing about life at Pacific Ridge. So this week, students invited the residents to join them on campus for karaoke and stand-up comedy performances, snacks, and art activities.